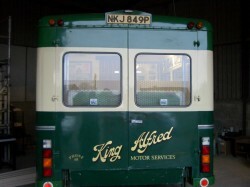 Friends of King Alfred Buses are a charitable trust of enthusiasts preserving buses and coaches from the famous local bus company King Alfred Motor Services, whose buses bore the likeness of King Alfred himself on their side panels. Friends of King Alfred Buses recently relocated to a new workshop facility near Winchester. They needed to maximise the available space within the building & contacted Hampshire Mezzanine Floors to investigate the possibility of the introduction of a mezzanine floor. The mezzanine floor was to be used for the storage of displaced parts & other materials that are used in the restoration & maintenance of their old & rare buses. HMF had meetings with Friends of King Alfred Buses to determine the best option for the siting & specification of the mezzanine & various options in different locations were considered. A storage platform of 4.8kN/m² was specified which allowed the possible storage of up to half a tonne per pallet up onto the mezzanine structure or significant point loads for small part shelving. 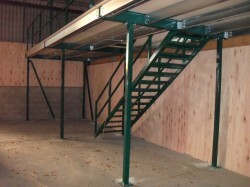 The mezzanine is accessed via a steel Part K open staircase complete with hand & knee rail & non-slip treads. All exposed edges of the mezzanine floor had box section double tubular hand & knee rail complete with kickboard. Part of the decision making process for the locality of the mezzanine was to fit a steel partition from the mezzanine up to the underside of the roof to segregate the building into 2 areas. This partitioning was pre-manufactured away from site & installed using steel mullion posts fitted with special plates from the mezzanine up to the roof which reduced installation time. HMF utilised a scissor lift for the safe installation of the steel partitioning. The finish of the entire project was chosen to replicate the colours of the old buses with a dark green mezzanine floor & cream steel partitions. The steel partitions were a powder coated paint finish which will withstand industrial wear. The installation of the £11K project took just under a week & was completed ahead of programme.